In writing My Marquette, I realized how seldom people think to take photos when historical changes are happening around town because it was very difficult to find some photos–some I never found–so now and then I like to take photos of what’s changing around Marquette. Some of my blog readers no longer live in the area, and if you haven’t been home for a few years, you would be surprised by how the Lower Harbor is being transformed. 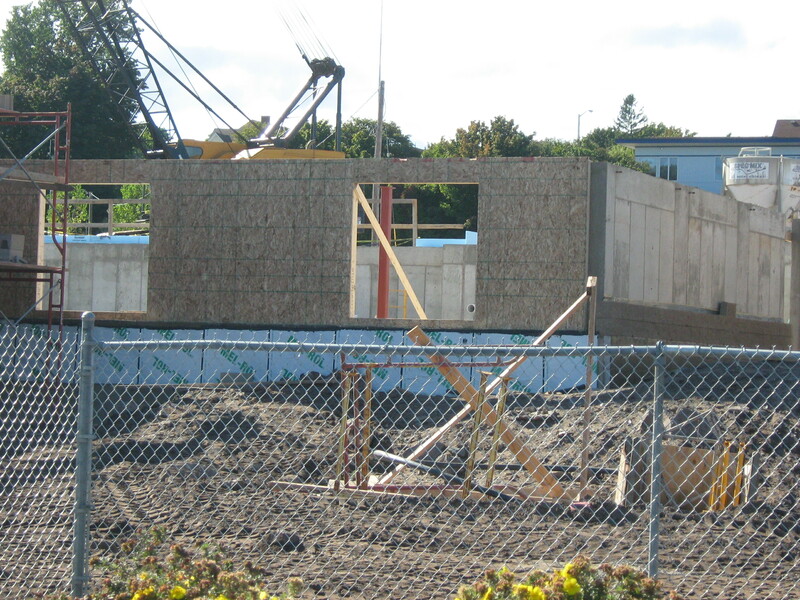 The new Founder’s Landing development is, after a slow beginning, moving forward rapidly with new condominiums (which have become controversial because their height blocks some people’s views of the water front). A new hotel has been begun, and although it was supposed to open this fall and is way behind schedule, it is also progressing. 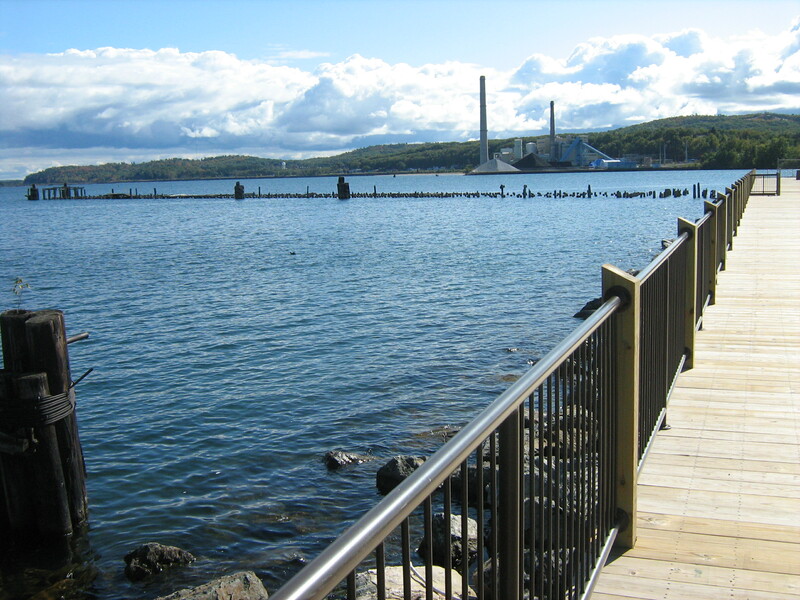 New walkways and an extensive boardwalk along the water allow for the best view, short of being in a kayak, that anyone has had for years of Ripley’s Rock, and the new boardwalk is quite massive. 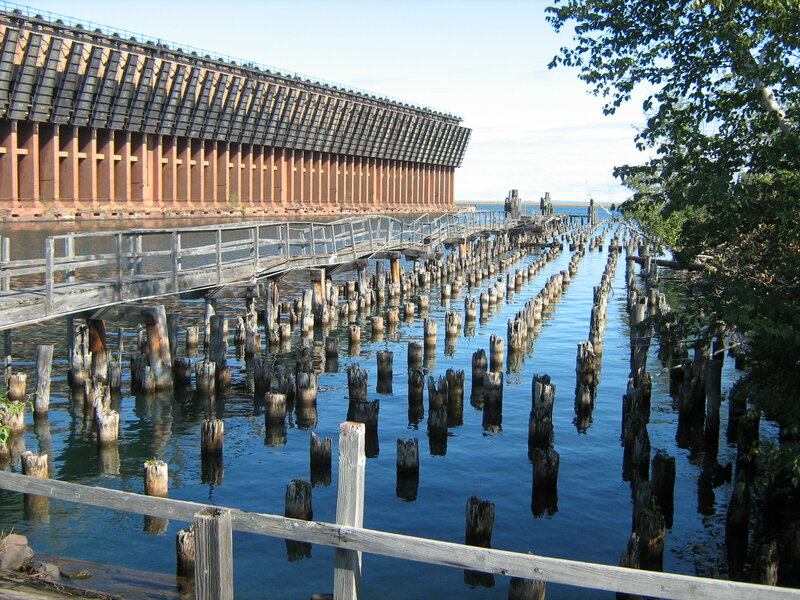 At the same time, ruins of the old docks remain as posts in the lake; hopefully, they will remain for years to come as reminders of when Marquette’s Lower Harbor was filled with ships and docks. 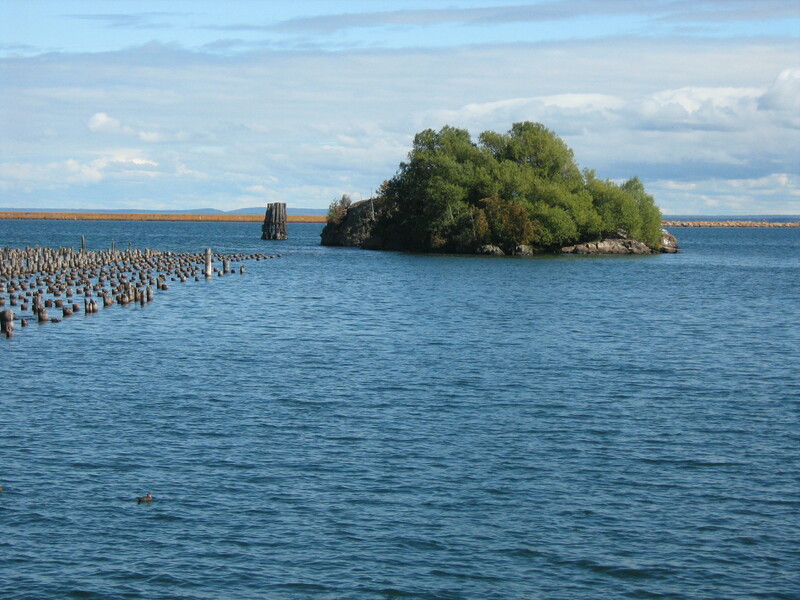 And the last ore dock in the Lower Harbor remains, tall and strong and not likely to leave us for decades yet to come while her older sister at Presque Isle Park remains Marquette’s last functioning pocket dock. This newly christened area of Founder’s Landing – Blaine Betts of Marquette holds the honor for coming up with the name – is a far cry today from what the early founders – Robert Graveraet, Peter White, Amos Harlow, Captain Samuel Moody – would have recognized, and Chief Kawbawgam and the Chippewa never could have imagined giant pocket days, much less the condominiums now facing the lake. Some are less pleased than others by the development, but overall, I believe the changes are all for the better. Marquette just seems to become more beautiful with each year, while retaining its natural charm and its connection to its past. 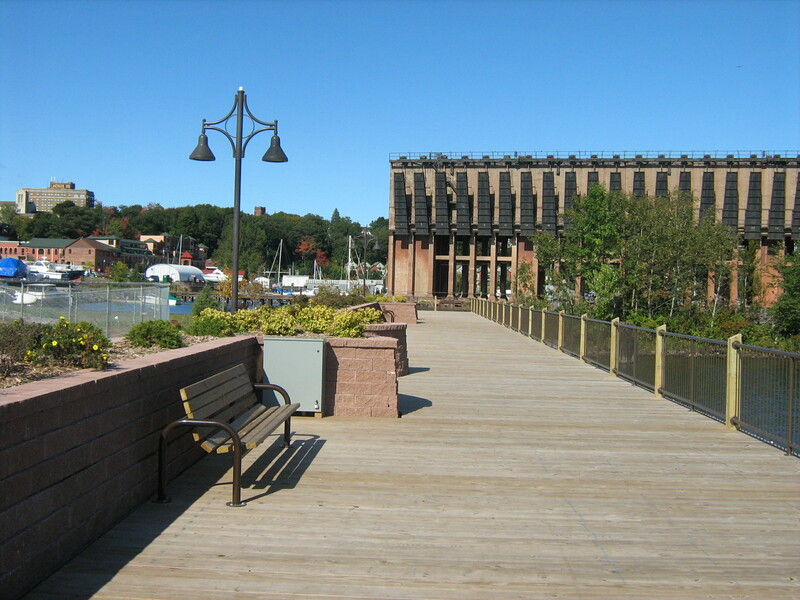 View of Marquette's Harbor looking South from the new Boardwalk. Granot Loma is probably the most impressive home on the Lake Superior shoreline. Rumor has it that the Kaufmans were not allowed to become members of the exclusive Huron Mountain Club, apparently because of their Jewish or Indian blood, so Louis G. Kaufman decided to build his own cottage along the lake. 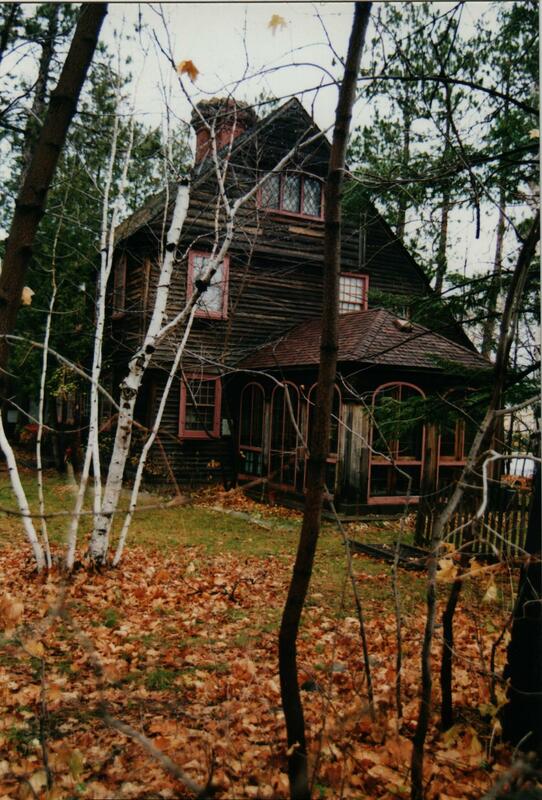 By the time he was done, it far outshone any cottage at the Huron Mountain Club and any home in Marquette as well. In fact, it is one of the most distinctive homes ever built. The house was built in 1919 on a granite loma (a flat, broad-topped hill), but the name was spelled as Granot Loma by using the first two letters of each of the first five Kaufman children’s names: Graveraet, Ann, Otto, Louis, and Marie. Louis G. Kaufman’s other children would be Juliet, Mary, and Jane. 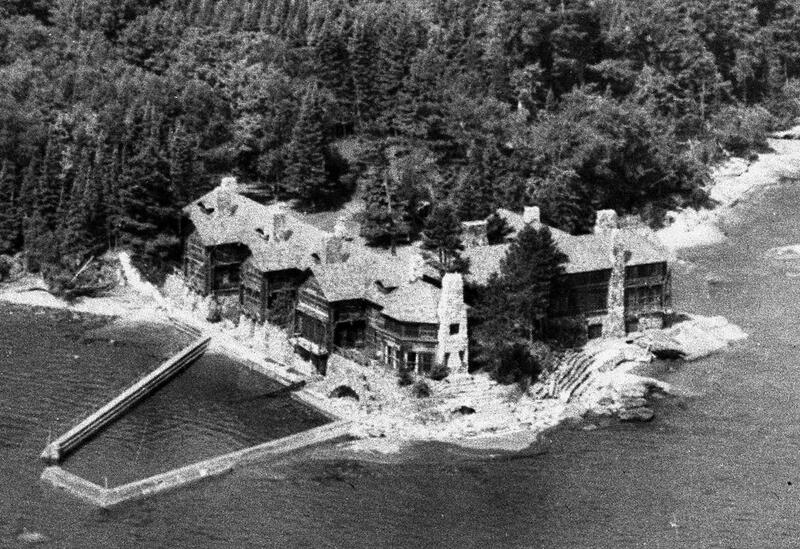 Built as a summer lodge, the 20,000 square foot home contains thirty-five rooms, and sixteen additional buildings for its Loma Farms to result in a full 5,180 acres, with 3.6 miles of Lake Superior shoreline. The lodge itself was built of Idaho pine from Oregon. Nearly three hundred workers were involved in the lodge’s construction. The size of everything in the lodge is astounding. The fireplace in the Great Room is large enough to hold four foot logs. The garage was built to hold twenty-four automobiles with room above it for twenty-four male servants. Above the laundry are rooms for twenty-four female servants. Even more impressive is the décor. Rustic Northwoods and Indian motif themes are notable throughout. All the original furniture was handcrafted by imported Norse craftsmen. Beds, chairs, and tables are made of white pine. The Great Room’s chandelier is made from a large pine stump. Birchwood and bark line the bedroom walls. The Kaufmans had no trouble attracting guests to the lodge when it was finished. George Gershwin himself picked out the grand piano (another would be chosen by Gershwin for Kaufman auditorium in the Graveraet School). Other famous visitors included Lionel Barrymore, Mary Pickford, Fred Astaire, Cole Porter, Alma Gluck, and Irene Castle. Entire Broadway troupes would come to entertain, complete bands would be transported here so the guests could dance, and a hundred guests at a time would descend on the lodge to go hunting and fishing. Meanwhile, the Loma Farms flourished with thirty purebred Guernsey cows, two hundred Yorkshire pigs, one hundred fifty cows and race horses, and six hundred chickens. Mr. Kaufman even had polo ponies which he took with him each winter when he went to Florida. When Mr. Kaufman died in 1942, his son Otto Young Kaufman continued to operate the farm until 1947 when it closed. Mrs. Kaufman died in 1956 in Monte Carlo. In her will, she left bequests to all her daughters and $80,000,000 in trust until the death of her last surviving daughter. The lodge was inherited by her daughter Marie Joan Kaufman and her husband Jack Martin. Joan Kaufman, as she was more commonly known, had several failed marriages before she married Jack Martin and inherited the lodge. The Kaufmans, being a banking family, naturally came into contact with the Biddle banking family of Philadelphia. Anthony Drexel Biddle would be known as “The Happiest Millionaire” with a film of that name based on his eccentric life. His nephew, George Drexel Biddle, son of his brother Craig Biddle, would be Joan’s first husband. They were married in 1926 when George was twenty-three and Joan only nineteen. The marriage lasted several years, resulting in two daughters, Daisy Laura Biddle and Lou Ann Biddle, and a son, Drexel Biddle. Drexel would be born at Granot Loma. For whatever reason, the Biddle marriage did not last, and Joan would go through a string of husbands, although she would have no more children. She married a man named Polk, divorced him, then married him again. She also married a man named Winterstien who was apparently a bully. Then in 1941, she embarked on her short-lived marriage to W.F. Ladd Jr. Her fifth divorce would be her last one. By 1946, she wed her sixth husband while still only thirty-nine years old. Jack Martin had started working at Granot Loma in 1938 as a barn boy or laborer, but soon he was travelling with Mr. and Mrs. Kaufman to New York and became close with the family. Like Joan, he had a history of divorces. He divorced his first wife about the time he went to work for the Kaufmans and married his second wife, Mary Lou Ellis, a young girl who worked at the farm. After Joan Kaufman divorced Mr. Ladd, she became jealous of Mary Lou, even calling the police to have her put off the property at one point. In 1946, Jack Martin divorced his second wife and married Joan. Jack and Joan would stay together the rest of their lives—nearly thirty years. My grandfather, Lester White, worked at Granot Loma in the 1950s and my uncle Jay White accompanied him at times. My family has several photographs which my grandpa took of the farm buildings from this time. During these visits, my Uncle Jay became friends with Joan Kaufman’s son, Drexel Biddle. My mother recalls Drexel visiting my grandparents in the 1950s to see my uncle. One year my grandmother gave Drexel an Easter basket, which he really thought was splendid. I guess millionaire’s children don’t get Easter baskets. After Joan Kaufman died in 1975, her husband Jack inherited the estate until his death in 1982. Then, Granot Loma was sold outside of the Kaufman family. Already in the 1970s, famed boxer Mohammed Ali had considered purchasing it, and Gerald Ford had thought about buying it to serve as his Michigan-based Western White House. The lodge was bought instead by Mr. L. Tom Baldwin, a bond trader and investor from Chicago for $4,255,000. After Baldwin made extensive repairs, he put it on the market again for $12,000,000 in 1990. When there were no takers, he continued to own the house as a vacation home to get away from the stress of the New York stock exchange. Today, he resides at Granot Loma full-time while operating his business. What better place to work from home? In honor of Marquette native John Lautner’s one hundredth birthday in 2011, two Marquette museums – the DeVos Art Museum at Northern Michigan University and the Marquette Regional History Center, are both holding exhibits on Lautner’s life and work. For more information on both exhibits, you can visit www.JohnLautner.org, which has links to both museums and their exhibits. This home was built by John Edward Lautner Sr. in 1912. He was a professor of modern languages at Northern Normal School and his wife was a budding artist. The house is a New England salt box style which looks like it belongs in Salem, Massachusetts. While an architect drew up the plans for the house, John Sr. and his son John Jr. built the house by hand. John Jr. would later become a famous architect himself who would study with Frank Lloyd Wright. John Lautner Jr. married Mary Roberts, the granddaughter of John and Mary Longyear. He would go on to design numerous buildings including the Googie Coffee Shop at the corner of Sunset Strip and Crescent Heights in Los Angeles, the Bob Hope home in Palm Springs, and the Chemosphere house, a raised octagonal home which looks like a flying saucer and was used in the film Body Double. Movie stars David and Courtney Cox Arquette today reside in one of his homes. Two books have been published about his work—John Lautner, Architect by Frank Escher and The Architecture of John Lautner by Alan Hess. 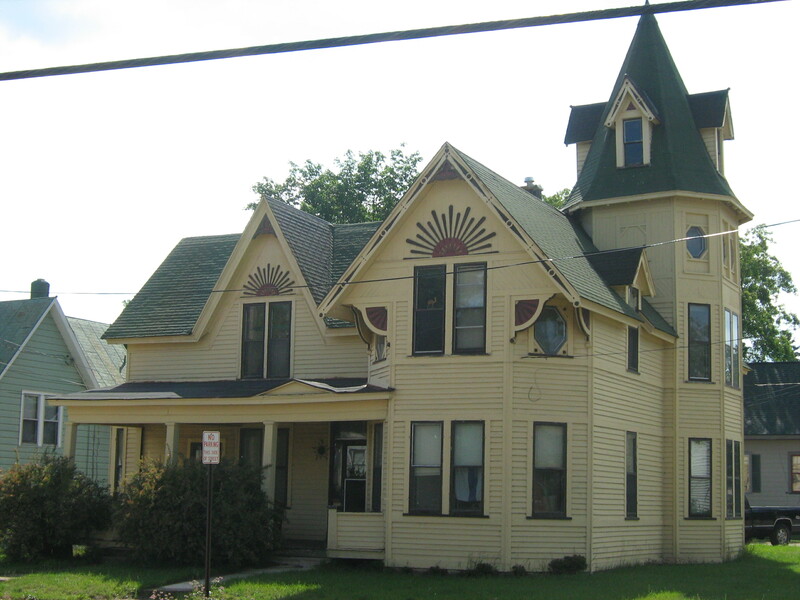 One of the most noticeable historic homes in Marquette that is not officially in the historic residential neighborhood of Arch and Ridge Streets, although it’s on the corner of West Ridge, is the Wagner home. This home was built by Honorable George Wagner, who was born in Prussia, Germany in 1834 and came to Marquette in 1854. He served the community in numerous capacities including justice of the peace, township treasurer, and alderman. In the early 1890s, he represented the First District of Marquette County as a member of the Michigan Legislature and introduced the Upper Peninsula Insane Asylum bill. In 1855, as a contractor, he laid the first tram road from the Jackson Mine to the Cleveland Mine. He erected sawmills in Alger County and in 1881, he discovered the Breitung Mine of which he became superintendent. Mr. Wagner was married to Gertrude Dolf in 1869, who was a relative of a relative on the Zryd side of my family. Consequently, my great-grandmother Barbara McCombie White used to visit the Wagner family in the early twentieth century. The last Wagner to own the home was Nettie Wagner, who later went to live with her Dolf family relatives. My distant cousin, Dorothy Dolf Drozdiak remembers when she was a little girl in the 1930s that Nettie Wagner used to toss her pennies from the tower’s windows. Today, the home is divided into apartments. You are currently browsing the MY MARQUETTE weblog archives for September 2011.